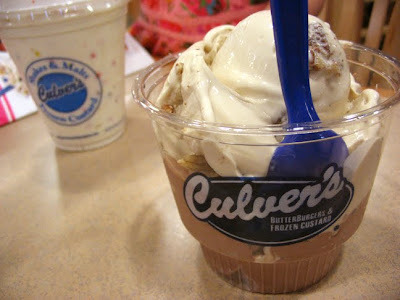 I had never heard of Culver's until last week when I was in Phoenix with my sister and their frozen custard came up. "Frozen woohoo??" I asked, the very combination of the words "frozen" and "custard" making my taste buds wave like a field of wheat. Within minutes we were en route, and Megan gave me the back story. In 1984, a Wisconsin family - the Culvers - re-opened a former A&W root beer stand and christened it “Culver’s Frozen Custard and ButterBurgers.” They selected only the freshest ingredients, prepared each meal exactly to a guest’s order and delivered it to their table with a great big smile. The concept quickly caught on and they’ve been "Culverizing" people with their midwest charm ever since. 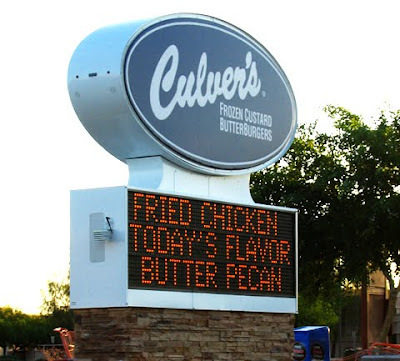 Today, the family own six Culver’s and oversee more than 370 franchised restaurants in 17 states - Arizona happens to be one of them (in fact, Phoenix is the only city west of middle America that has Culver's). Their unique twists on the conventional ice cream/burger stand business are what impress me. Who hungry for greasy sandwich could resist something called a ButterBurger? 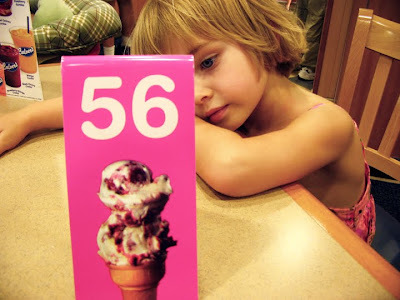 Who has ever heard of frozen custard? More importantly, what does it taste like?? The frozen custard comes traditionally in vanilla or chocolate, with a rotating flavor of the day (and yes, it's different every single day of the month - from Butter Brickle to Double Marshmallow Oreo to Bananas Foster to Georgia Peach). Our flavor of the day - Butter Pecan (yum). I opted for a double scoop of the Butter Pecan and Chocolate. My niece Maddie got a Concrete Mixer (their Blizzard) of vanilla custard and mini m&ms. The first thing I noticed upon first bite was the incredible texture. This is easily the smoothest frozen treat you'll ever taste. Not as heavy as the name implies, both flavor and body are incredibly light and silky. The chocolate isn't overly sweet, like a creamier Wendy's Frosty. The Butter Pecan had great full flavor with large chunks of fresh sweet pecans. Ah yes, this is indulgent Americana fast food I can enjoy. Check out the locator to see if there's a Culver's near you. But I'm afraid for guilty-pleasure frosty treats us west-coasters are going to have to stick with ye ol' Foster's Freeze or Yogurtland..
En Vitesse: More Sonoran Dogs!